Do you love sweet romance novels that make you laugh? 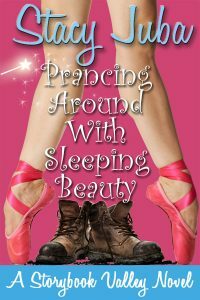 Then you’ll want to check out Stacy Juba’s brand new chick lit novel, Prancing Around With Sleeping Beauty, the second book in the Storybook Valley series. 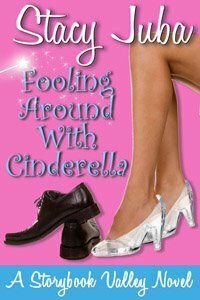 The book was released March 5, and while it’s a follow-up to the popular Fooling Around With Cinderella, both novels can also be read as stand-alones. Come discover Storybook Valley, a fictional theme park in the Catskills of New York. If you love small town romance with humorous characters, theme parks, fairy tale fun, and amazing love stories, then Storybook Valley will be your new favorite series. Unfortunately, he’s the grandson of her family’s archrival and she doesn’t want to disappoint them. After all, her parents imagine her as a proper princess – hence her namesake Aurora, AKA Sleeping Beauty. Complicating matters, Rory’s also dealing with a surgeon boyfriend who’s perfect for her (sort of), an obnoxious boss, and desperate dance moms. Kyle wants to change her whole life, but Rory doesn’t like the stakes. After all, princesses are the ones who get the happy endings. . .aren’t they? Twilight had descended over the strip mall which also contained a pizza place, children’s art studio, New Age shop, bakery, and a consignment store with identical brick facades. A long sidewalk connected the storefronts. Rory’s phone chirped and she scanned a text as she strolled through the parking lot. A message from her older brother Jake, who lived in Maine. Happy 25th. What new rose crap did you get this year? Instead of making her chuckle, his joke elicited a sigh. She missed Jake and his toddler Quinn, but he never came home anymore thanks to a stupid fight with their parents. They went ballistic after he got a girl pregnant and accused him of ruining his life. Jake and the mother broke up, not surprising since she was a total flake, but he got an apartment a couple blocks away from her to be near his daughter. His absence meant he couldn’t take over the theme park, leaving room for Dylan to step forward. Augh! Rory stumbled over something and toppled to the ground, her phone sailing through the air. Her right hand slammed against the pavement, and pain seared through her. Sitting up, she glared at the object that had blocked her path. A spiky creature in a plastic carrier glared back at her. Rory blinked. She could accept a black cat crossing her path, but she owed her unceremonious spill to a needle-infested rodent? “Who leaves a porcupine in the middle of the parking lot?” she demanded. “It was a rhetorical question.” Rory risked a glance at her throbbing hand and winced. Blood dripped down her finger. She’d always considered her family’s rivalry with Duke Thorne a bit ridiculous, but now Rory related to her granddad’s agitation. Thanks to sprawling over one of Duke’s stupid hedgehogs, she might have sprained her finger. Shifting position, Rory glowered through the cage at the spiky black ball that had caused all the trouble. It huffed and puffed, quills poking outward, a breathing pincushion. My . . . she hadn’t realized hedgehogs had such tiny eyes. And what a cute button nose. This little guy—Turbo?—seemed skittish. “Is it a white rabbit?” Rory muttered. “I’m an instructor at the dance studio. We were having an open house. I got a text, and apparently, I wasn’t watching where I was going.” Rory battled the temptation to peek under the gauze. “Let me get this straight. You’re a dancer? I thought dancers were graceful.” His brown eyes crinkled with amusement. Their shade reminded her of a caramel latte, warm and inviting. He wore such a deadpan expression that Rory almost laughed. His dry comic delivery must enliven his presentations. Her grandmother Lois, Storybook Valley’s self-appointed entertainment director, would remark that Kyle had charisma. She peered into the cage. Was it her imagination, or did Turbo look calmer now in Kyle’s presence? His quills had relaxed, laying down and pointing toward the back. After a hesitation, Rory climbed to her feet and trailed him to the Zoo Mobile. With her left hand, she finished a clumsily misspelled text to Jake, omitting mention of the accident. Otherwise, her brothers would ask her for the next month if she had tripped over any hedgehogs lately. She leaned against the van as Kyle slid the bearded dragon’s carrier out the side door and positioned Turbo’s cage in its place. Over the next ten minutes, he explained how many bearded dragon species existed (nine) and what they ate (insects). If Rory ever appeared on a TV game show, she hoped they quizzed her on bearded dragons, porcupines, and hedgehogs. Kyle discussed animals the same way Brad talked about robotic-assisted surgery. She wondered if Kyle had a college degree. Her guess was no. After all, how much schooling did it take to drive a Zoo Mobile? Once you memorized the spiel and learned how to care for the animals, what else was there to learn? As an employee that far down the company ladder, Kyle probably wasn’t aware of the Callahan feud. After the bearded dragon lecture, Rory washed her cut and rubbed in bacitracin ointment. Kyle unwrapped a large Band-Aid, but instead of extending it to her, he pressed the patch over her skin. As their fingers touched, a shivery sensation whispered down Rory’s spine. I am not attracted to the zoo guy. And if you discover that you love the Storybook Valley books, be sure to join Stacy’s street team, the Storybook Valley Sweethearts, on Facebook for book launch activities and exclusive sneak peeks. Members will get to hear the latest Storybook Valley news before anyone else, and even read excerpts of works-in-progress and give input on cover design. Thank you for featuring Sleeping Beauty during the launch week! I really appreciate it.